I had one of the more intense writing sessions in my life the other day - getting about 17 pages and 6000 words out in 2,5 hours. But that’s not as important, although fun, compared to the quality and how we did it. I’d been coaching and teaching at a company for 4 days straight, meeting ca 200 people from 12-15 teams to talk about their opportunities and challenges to apply agile and lean thinking within their current context and organization. The obvious question on the last day was: Could you just summarise your thoughts for us? Write some ideas for improvements and next step and stuff. So we did. And I heard that the report was well received (hence I presume the quality was adequate), but in this post, I wanted to talk a little bit how we worked to get this down, and why that helped us (me) to write a better report/message. I had one of the more intense writing sessions in my life the other day - getting about 17 pages and 6000 words out in 2,5 hours. But that’s not as important, although fun, compared to the quality and how we did it. I’d been coaching and teaching at a company for 4 days straight, meeting ca 200 people from 12-15 teams to talk about their opportunities and challenges to apply agile and lean thinking within their current context and organization. Could you just summarise your thoughts for us? Write some ideas for improvements and next step and stuff. So we did. And I heard that the report was well received (hence I presume the quality was adequate), but in this post, I wanted to talk a little bit how we worked to get this down, and why that helped us (me) to write a better report/message. I brought out the pack of stickies and went to the far right (the end in an imaginary workflow) of a giant whiteboard/glass work. We created a nice (?) sign with the goal and asked my question. What do we want them … to … who are they, by the way? Know your audience - who is this for? That brought us to the second thing realized - there’s a few different audience to the report (and most things you write or present). They have different needs and if we’re going to be successful we need to several or all of these need. We started to write headings with the different audiences and their individual needs below. And some more groups. As we wrote these headings/actors down we started to switch out the generic names to some concrete personal names that we had met during the week. Instead of team lead, we wrote “Ricky in the awesome team X”, for example. Ricky was a guy that looked really pumped and it was easy to see him taking this further. At this point, I started to see similarities to Impact mapping, which is an awesome tool to structure the outcome needed to deliver value in a software development (and more). Now that we had the goal, purpose and the audience of the report we could start to think about how we would go to get all the different feelings across - this is the impact level in the diagram above. Have a list of suggestions for how to plan and execute across teams. I was a bit worried going into this part but actually, think about the different actors and what we talked about when I met them made this very easy and it all fell out in about 10 minutes. What are we going to write - deliverables! 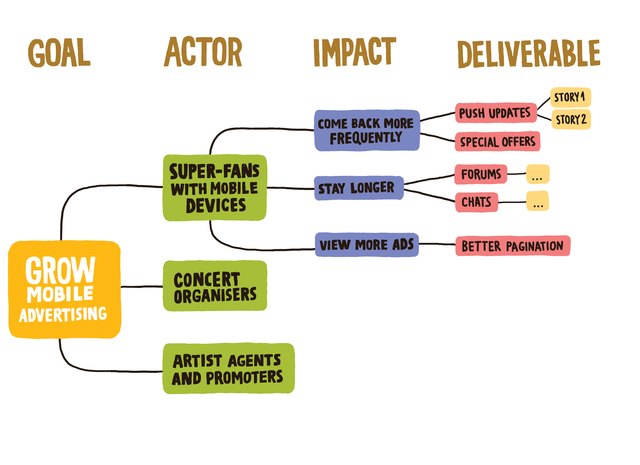 That brought us to the last part of the impact map structure: deliverables. In this case, we did actually post anything on the board, but rather just started a document. So far we had spent ca 1 hour in the room and not a single word was written. I now went for a glass of nice hot water (yes, picking up some strange Asian habits) and cracked open the computer. It was writing time. I was lucky in so that I had my “product owner” (the person that was going to send the report to the correct people) in the room and we decided that I was going to write the report and she reviewed it for errors on both syntactic and cultural levels. We had about 1 hour left before we were heading for lunch so we decided to do two 20 minute time-boxed iterations, with a 10 minutes review session after each. The first one I blew altogether as I now was so pumped to write this report that I just started at one end. With two minutes left I realized that this is not incremental delivery, it’s just iterative. We discussed that in the first review session and I spent the second time box just producing the table of contents, which outlined the entire report. I, of course, used the table of contents-feature of Word (in this case) that picks up my headings, so that my report also was well laid out. Once that was written I used the remainder of that time box to fill out one part of the report, used as an example. My product owner could now review the structure of the overall report as well as see some examples on the level of writing. Once that was done we went for lunch. Getting back I now had a well-laid out, prepare document where I basically knew what I was going to write about under each heading. From that point on I wrote the whole thing (17 pages) in one 2 hours, frantic session. We had a review session and wrapped the document in under 3 hours. By starting with the end in mind and focus on the outcome (the feelings we wanted people to have after reading the report), I’m convinced that we hit the target much better than if we would have just written the report from my own thoughts and ideas. It was very helpful to think about the different audiences in form of individuals and people that I had actually talked to. I remember their context more clearly and could easily come up with some tips that would help them. Once those impacts were written it was a joy almost, to get down to business and just write the entire document. I can honestly say that this was one of my best writing sessions to date. I hope you too, found some use in reading how we structured this session.